The late renowned Lilly Pulitzer is one of few designers who have what most would call, a following. Her induction and timing into the designing world was essential to her success. As a housewife in Palm Beach, FL and married to a citrus farmer, Lilly found herself a small career with a successful juice stand on the property. Tired of ruining her clothing with juice stains, she went on the hunt for materials and textiles that would withstand her new found business venture. After making a few aprons for herself, Lilly's juice customers were no longer interested in juice, but her fashionable creations. So from there, the juice stand turned into a fashion pop-up. Revolutionizing the shift dress, Lilly began to design for women with the highest fashions and among world renowned designers. Drawing in crowds such as sorority collegiates, classy prepsters and beach housewives, Lilly started a lucrative following, attracting such profitable consumer demographics. After many decades of success with her designs, the brand is now a flourishing company with e-commerce and many franchises and boutiques around the nation. The name is living well beyond the designer herself, who recently passed, with the help of people like Keni Valenti who collected the pieces to create the exhibit of Lilly's best creations currently hosted at the Palos Verdes Art Center in California, co-curated by Jeff McKay. 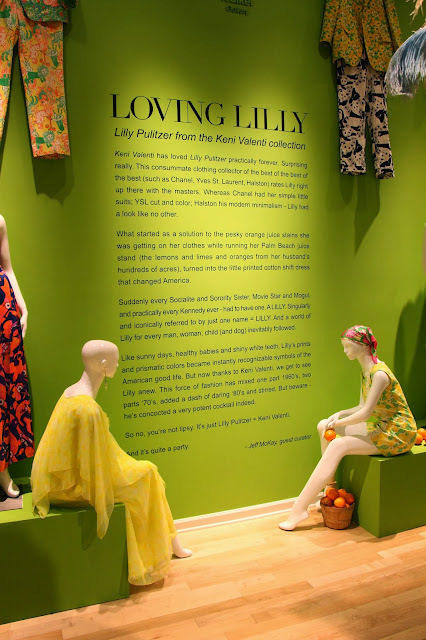 Kicking off the exhibit's popularity with a luncheon with Lilly fans from the SoCal area, the colorful crowd gathered to commemorate the collection as well as the late designers accomplishments. An added bonus for this Lilly Lover, I was the winner of the vintage '60's shift dress donated by the gracious Keni Valenti!